In the past, teeth were most commonly repaired with amalgam (silver) fillings or gold restorations. Thanks to the advances in modern technology, teeth can be restored with a more aesthetic and natural appearance. There are different types of cosmetic fillings currently available. 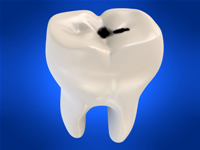 The type used will depend on the location of the tooth and the amount of tooth structure that needs to be repaired. The most simple form of ‘white filling’ is technically called a composite. It is made up of a composite quartz resin and usually contains some sort of light sensitive agent. These light cured composites are extremely cosmetic and most often bonded into place in one appointment. They can be used both in the front of the mouth as well as in your back teeth. In order to bond a filling material to your tooth it is first necessary to remove decay, prepare the tooth and then condition the enamel and dentine. Once conditioned, a thin resin is applied which bonds to the etched surface. After placement, composites are hardened by shining an intense light on them for a specified period of time.